Definition at line 43 of file llvlmanager.h. Definition at line 47 of file llvlmanager.cpp. References LLDynamicArray< Type, BlockSize >::count(), i, mPacketData, LLDynamicArray< Type, BlockSize >::reset(), and S32. Definition at line 57 of file llvlmanager.cpp. References CLOUD_LAYER_CODE, LAND_LAYER_CODE, llendl, llerrs, mCloudBits, mLandBits, mPacketData, LLVLData::mType, mWindBits, LLDynamicArray< Type, BlockSize >::put(), S32, and WIND_LAYER_CODE. Definition at line 140 of file llvlmanager.cpp. References LLDynamicArray< Type, BlockSize >::count(), mPacketData, LLDynamicArray< Type, BlockSize >::remove(), and S32. 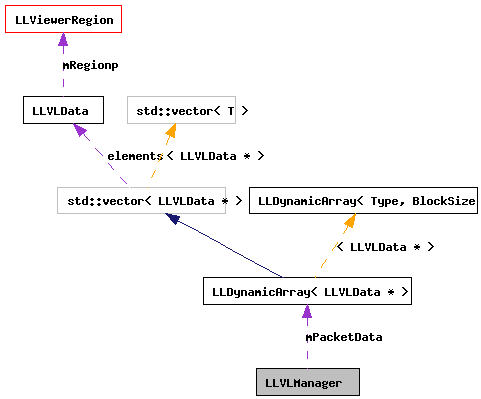 Definition at line 130 of file llvlmanager.cpp. Definition at line 120 of file llvlmanager.cpp. Definition at line 135 of file llvlmanager.cpp. References mCloudBits, mLandBits, and mWindBits. Definition at line 125 of file llvlmanager.cpp. Definition at line 115 of file llvlmanager.cpp. Definition at line 79 of file llvlmanager.cpp. References CLOUD_LAYER_CODE, LLDynamicArray< Type, BlockSize >::count(), decode_patch_group_header(), FALSE, i, LAND_LAYER_CODE, mPacketData, LLDynamicArray< Type, BlockSize >::reset(), S32, and WIND_LAYER_CODE. Definition at line 66 of file llvlmanager.h. Referenced by addLayerData(), getCloudBits(), getTotalBytes(), and resetBitCounts(). Definition at line 64 of file llvlmanager.h. Referenced by addLayerData(), getLandBits(), getTotalBytes(), and resetBitCounts(). Definition at line 63 of file llvlmanager.h. Referenced by addLayerData(), cleanupData(), unpackData(), and ~LLVLManager(). Definition at line 65 of file llvlmanager.h. Referenced by addLayerData(), getTotalBytes(), getWindBits(), and resetBitCounts().